Call of Our Lady of the Rock to humanity. Shrine of Our Lady of the Rock. Bogotá Colombia. "Little Children of my Heart, the Peace of my Lord be with you all and my Maternal Protection, accompany you always, little ones, everything is about to be fulfilled as it is written in the Holy Word of God; I suffer in seeing how this humanity of these end times, every day becomes more distant from God. The chastisement will soon come and you can no longer avoid it, because it is the Justice of God sending it to you, to restore the order and the right in the creation. Heaven, little Children, is very sad for your bad behavior, many souls are going to be lost and millions will perish at the passage of the Divine Justice. The force of nature will unleash itself throughout the earth and there will be no safe place in it. Run, again I say to you, in putting your accounts in order; seek one of my predilects (the priest) and make a good confession of life; be spiritually prepared, for the days of God's Just Wrath are about to begin. Do not proceed in your sin, wake up, for the trumpets of the Divine Justice are about to sound, which will announce the beginning of the great purification and there will be no going back. Gather yourselves in prayer, fasting, and penance, so that you may cope with the days of the Divine Justice, which are approaching. Little children, all the evil doers, are going to disappear from the face of the earth; It will only remain in it, the people of God who will be purified, as the gold is purified in the fire; the purification of the chosen people will be until they shine like a Crucible. Only purified in this way, they will inhabit the New Creation of God. The days are near my children where you will cry to Heaven and it will seem not to hear you; humanity will soon feel and experience what is to be without the Spirit of God. They will invoke and cry, Lord, Lord, come to save us, and no one will hear them! Only those who are in God's grace and put their faith and trust in the Lord will be able to overcome this trial. Spiritual dryness and the absence of the Word of God, for a time will accompany you; Your faith will be put to the test! You will be tempted and attacked by demons, and many, for not being prepared, will be lost. The test of faith, will refine your spirit. Therefore, little children, I urge you to read the Holy Word of God, to absorb and meditate It in your heart, so that it may consolidate in you and thus, you may overcome this trial of faith, with which my Father will test you, to see if you are worthy to be called His inheritance. Little children, again I say to you, prepare yourselves spiritually because the days of spiritual combat are about to come. Place your Spiritual Armor morning and night; stay in God’s grace and love and help one another, so that the strength of Love together with your faith, will help you overcome the days of great purification that are approaching. 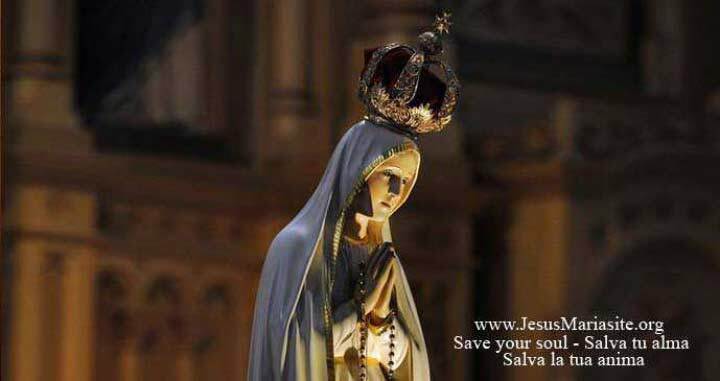 Do not discard my Rosary, for it is the weapon that will give you victory over the forces of evil. Little children, stay in the Peace of my Lord. Your Mother loves you, the Lady of the Rock. Let my messages and my dedication be known to the whole world." Souls who are in mortal sin, repent at once!